Devotion to the Blessed Virgin Mary under the title Undoer of Knots or Untier of Knots is at least three centuries old; Johann Georg Melchior Schmidtner made a painting of the subject in Augsburg around 1700. For this commissioned work, I eschewed the Baroque style of Schmidtner’s painting, while retaining is essential elements. The style is one indebted to Gothic, Northumbro-Irish, Persian and Mexican sacred art. The Virgin Mary I presented as the Immaculate Conception, standing over a serpent on a crescent Moon. There are twelve stars about her head, inside the halo. A dove Representing the Holy Ghost is also within the halo. 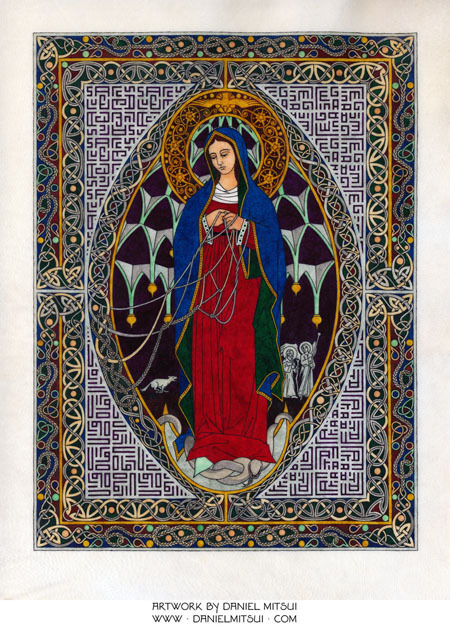 Her posture and clothing have some similarity to the image of Our lady of Guadalupe. The cords that she is untying form elaborate knots and braids that fill a mandorla surrounding her figure, and a border to the entire drawing. As in the Baroque painting, the serpent upon which she is standing is tied in a knot; here, I depicted it with a knotted tongue also. The Archangel Raphael, Tobias and his dog, who appear in miniature at the bottom of Schmidtner’s painting, I depicted in the background. The spaces between the mandorla and the border I filled with orthogonal letter patterns spelling Salve Regina Virgo Maria. The original drawing was made on private commission. An open-edition giclée print of this drawing is available for $101. You may use the button below to pay via PayPal, debit card or credit card. Be sure to confirm the shipping address. See this page for additional ordering instructions and general information. If you want to pay via a check or money order, please e-mail me at danielmitsuiartist at gmail dot com.